First a confession: I had low expectations for Yellowstone. I included it in the mix of parks to visit this year not necessarily because it was a place atop the list of ones I really wanted to see, but because I figured if I’m trying to write about the future of national parks I really should visit the world’s first one. I went to Yellowstone as a kid, as part of a long, cross-country journey. And while I have vivid memories of some of the other national places we hit on that trip — Grand Canyon, Redwood, Lassen — I don’t remember much of anything about Yellowstone other than Old Faithful and heat and crowds. So after picking this as probably the one family trip of the year, I started having buyer’s remorse. Should we be going somewhere else? Grand Canyon? Zion? Glacier? “Why don’t I remember much about Yellowstone?” I asked my mom a few months ago. 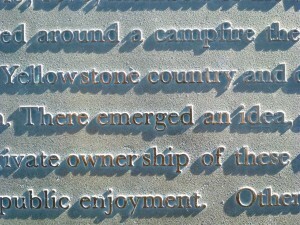 She said that, unlike with the other stops, our time in Yellowstone was very brief. It was on the way back to Wisconsin, the end of a six-week journey. (My dad was able to tie the trip — a big loop across the western United States — into a convention in San Diego.) We only spent one full day in Yellowstone. And there wasn’t any room in the campgrounds. So we stayed at a nearby KOA. And the bugs were horrible. Hearing this reminded me that there is something to be said for spending a week in one park. That used to be commonplace. But the length of vacations are shrinking. And that’s too bad. Because when you spend a day in a place, you only get a taste of it. When you spend a few days, you create lasting memories. But when you spend a week, you create an attachment. You are a part of the place. And the place is a part of you. That’s how I have felt for years about the Redwoods and the Grand Canyon. And that’s how I feel now about Yellowstone. I spent two weeks camping there in June — the first with the family, the second with a college buddy, Mark Schnorr, who rode his motorcycle from the Twin Cities to Yellowstone. — Madison Junction. That’s where we camped the first week, just up the hill from the junction of two rivers and a plaque commemorating a famous campfire in 1870, the spark that led to all national parks. Maybe. Sort of. Not really, it turns out. In each month, I’ve been picking one park to symbolize one issue. With Yellowstone, I wanted that issue to be the broad, sweeping, big picture issue: Simply, what is a national park? Yellowstone seemed to be the fitting place to ask that question. Not only is it the world’s first national park, but it is a prime example of how the national park idea has evolved — and undoubtedly will continue to evolve. My copy of the book now is full of highlighted sections. But one of my favorite parts involved the story of the campfire conversation. For years, this was held up by the park service, politicians and historians as the place where it all began. But in the 1960s, mainly because of the scrutiny of Yellowstone historian Aubrey Haines, the story fell apart. The truth is much more complex than the one told for generations. Yet a plaque remains at Madison Junction. 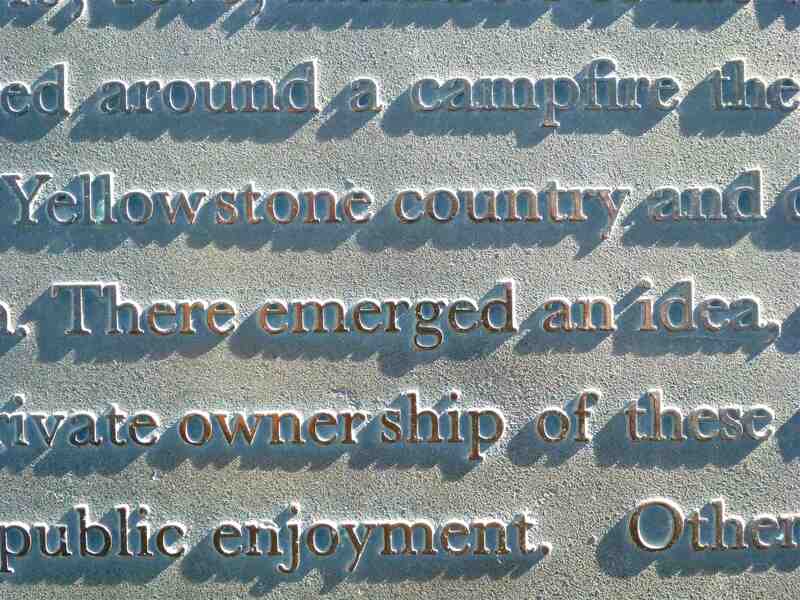 When I read this, I wanted to find the plaque. One of the first mornings were were there, I woke before sunrise, went for a walk and just happened to stumble upon it as the sun was coming up. I decided that this spot is one of my favorites in Yellowstone. I like it even better now that the campfire story is considered a myth. I like that its story is complicated and messy and unknown. It is a reminder that past isn’t simple (and that we shouldn’t try to oversimplify it). It is a tribute to the historians who set the record straight (and those, like current Yellowstone history Lee Whittlesey, who continue to do so). It is a perfect jumping off point for a look into the future — which also undoubtedly will be complicated and messy and unknown. Beyond that, there is another simple reason why Madison Junction is one of my favorite places in the park is this: It is stunningly beautiful. — The girl who cried bison. My wife and I both shrugged this off as Mia trying to trick us. She loves to do that. And often is quite good at it. 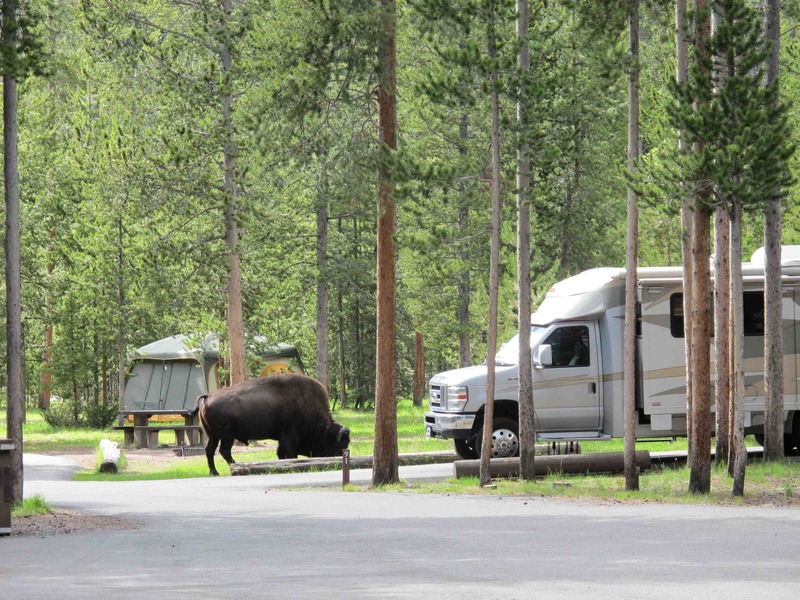 When she yelled again, though, we poked our heads out of the tent and, sure enough, there was a bison ambling through the campground. We would see hundreds of bisons in the days to come. But I think I’ll always remember this one, just because when I saw it I was awed by just how large it was. I saw all kinds of wildlife while there — including one grizzly. (From a distance, while overlooking a river on the west side of the park. And when he spotted us, he ran away and kept running far into the distance.) But the bison are one of the reasons I decided to go to Yellowstone. If you’re trying to illustrate that parks have changed dramatically in the past — and the future is complex — you can start by pointing at the animal on the NPS patch. And going to Yellowstone, the only place in the lower 48 where wild bison have persisted since prehistoric times. I not only spent some time with NPS staffers, talking to them about bison management, I went to some land outside of West Yellowstone — site of cabins, teepees, an old yellow bus and a relatively new SUV named Jackson Browne (after the singer who donated it to the cause) — and hung out with folks from the Buffalo Field Campaign. Think Greenpeace for bison, advocating for them to roam free across the country. The next day I went north of Yellowstone and met with a longtime rancher, Drusca Kinkie. Suffice it to say, it’s hard to imagine two more different viewpoints. It hammered home the challenges faced by the NPS for the future, something that Dave Hallac, the chief of the Yellowstone Center for Resources, brought up when I met with him. The biggest questions for the future of Yellowstone — and perhaps for all parks — might not be what happens inside them. It’s what happens on their borders and beyond. This is what I plan to write about eventually. The modern-day Madison Junction. The bison. 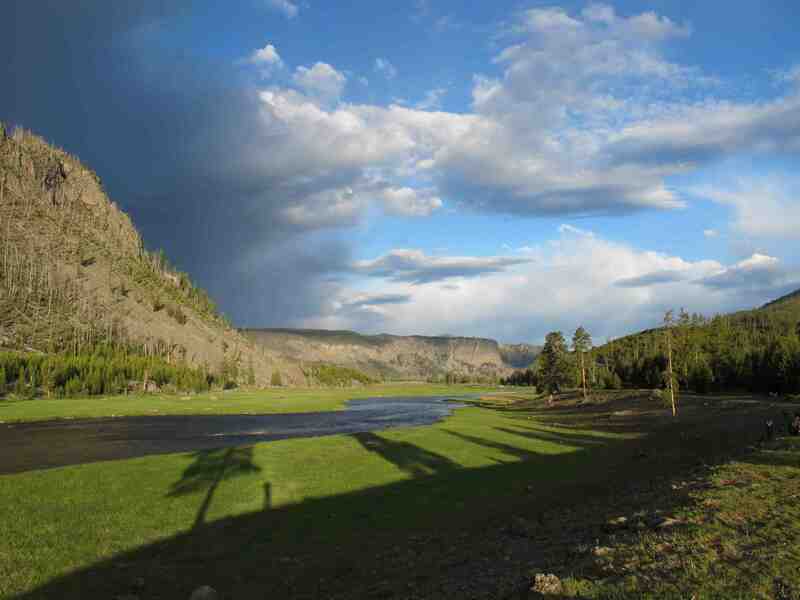 The questions for the future, not just within Yellowstone’s 2.2 million acres, but beyond them. — From bison jams in Yellowstone to traffic jams in New York. One of the park service’s big pushes for the future is “relevancy.” You hear this word over and over again. The bottom line goal basically is to have a more diverse park visitor. Not just the retirees who took their kids to parks years ago and the kids who are now Baby Boomers. How does the park service attract more young visitors? More minorities? More people who, when it comes time to defend the parks, will be there for them? One way the park service hopes to accomplish this is by bringing the national parks to the people. By improving and emphasizing trails and rivers and parks that are close to or in big cities. With that in mind, I wanted to include an urban park in the journey. And I figure it doesn’t get more urban than camping in Brooklyn. So that’s where I’m headed next: Gateway National Recreation Area.